When a man decides to return home from where ever he is sojourning, the general expectation is that he is relocating into either his personal house(rented or owned) or his family house. 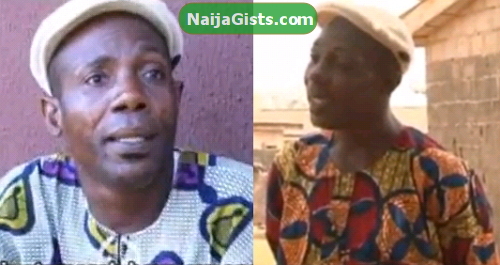 But that is not the case with popular Yoruba comic actor, Adeola Soremi, who is better known as Lanko. The bald-headed and lanky rib-cracker who relocated to his home-town, Abeokuta, Ogun state, from Ikorodu in Lagos state, more than a year ago has been taking residence in different hotels ever since. Findings by Different Stroke Media has revealed that the witty actor started off with Neu Gate Hotel behind MKO Abiola stadium, Ijeun Tuntun, Abeokuta, and resided in the hotel owned by former Local Government chairman of Ifo, Hon. Sikirullahi Ogundele, for many months. But as you read this, the actor has “packed out” of the five thousand naira per night hotel, into another one on the outskirts of the city. He is now reportedly “living” in Luk-Jim hotel, a newly commissioned hotel within Olowomoore area of Abeokuta. And the hotel owned by a socialite, Lukmon Ogo-Oluwa, has now become the new haven for the fair-complexioned comedian who has a predilection for A+ women. And for how long “Omo Oba Dubai” as the talented thespian also calls himself, is going to be a “tenant” in the hotel before moving into another one remains a matter of time. LOL @ fool @ 40, he is acting in that drama…hihihihihi. now he is leaving it. i like this,bcos is my man. Saheed Ojubanire,your report is not compete as far as am concern. There must be a reason why he is doing that. Go and make more research and give us a better report! Datz yoruba 4 u guyz at dia..
Chijoke do not generalised d pple coz we stil have many of both d xposed n non xposed,educated and non educated,rich n not rich etc dat can neva act dis way. No mata wat reason it is,hotel life shuldn,t be his resort.